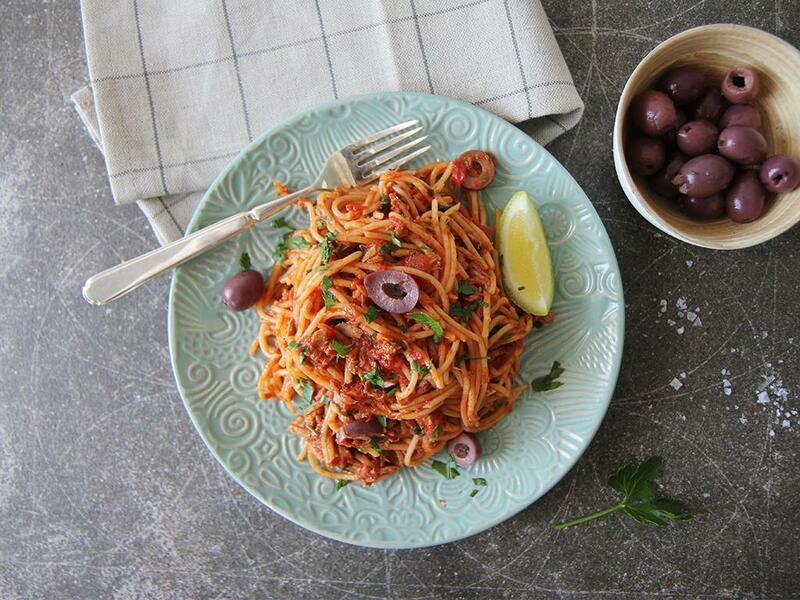 Tuna, olive and tomato based sauce flavoured with lemon, garlic, capers, chillies and cinnamon. Served with spaghetti and garnished with parsley. Quick, simple and on the table in 20 minutes. Bring a large saucepan of lightly salted water to the boil. Add a few drops of olive oil and the spaghetti and cook for 6-8 minutes. Don’t overcook the pasta - you want it al dente, that’s slightly chewy and uniformly translucent. Once cooked, drain and keep warm in a colander over a saucepan of hot water. Sprinkle spaghetti with a little olive oil to prevent it from sticking together. Place a frying pan on medium heat. Open the tin of tuna and drain the oil into the pan. Add the garlic, capers, chillies and cook for about a minute. Stir in the tuna, black olives, tomatoes and cinnamon. Now tip in the spaghetti, parsley (reserving a little for the garnish), lemon juice and a splash of olive oil. Toss well. To serve, place the tuna spaghetti on the plate or bowl and scatter the remaining parsley on top.